While other NBA teams are mulling over franchise-altering trades, the New York Knicks made a low-key deal at the trade deadline in moving veteran point guard Pablo Prigioni to the Houston Rockets for Alexey Shved and two second round draft picks. The 37-year-old Prigioni spent 3 seasons in New York, averaging 4 points, 3 assists and 1 steal in 18 minutes. From the field, Prigioni shot 44% (41% from three). 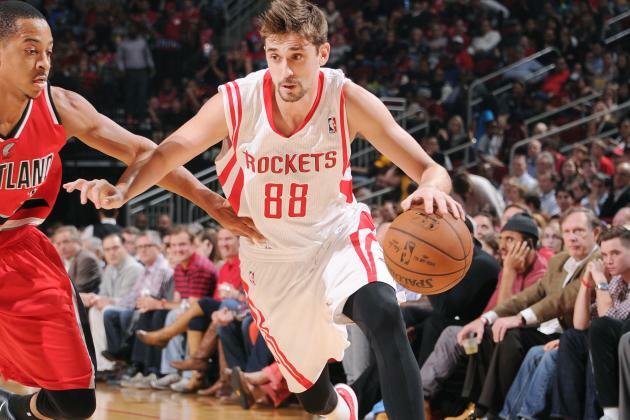 The 26-year-old Shved was acquired by Houston from Philadelphia earlier this year. In 9 games with the Rockets, he’s averaged 3.2 points, 0.3 assists and 0.4 rebounds in 6.6 minutes per game. For the season, the Russian point guard is averaging 7.6 points, 1.9 assists, and 1 rebound on 39% shooting. Before the All-Star break, Prigioni had not played in eight of the last 12 games, fueling rumors he was on the trade block. Prigioni will be joining a play-off bound Rockets team that is currently fourth in the Western Conference with a 36-17 record. No more sneaky steals and spot-up three-point shooting in NY. Prigioni will be missed, but this is yet another move that benefits both parties. The Knicks get another young point guard to try to mold, and Prigioni gets to join a contender where his sticky hands and floor leadership will be well-served in spot minutes. Shved is a 6’6 point guard and I’m sure we can put that to good use. His recent teams have given up on his potential, so hopefully he views this as a “last shot” of sorts to show he’s a valuable player.